Live an awakened life with purpose and meaning. Or are you finding yourself hitting the same wall? Ready to get clear about your Here so you can chart your There? Something new awaits, but something old is trying to keep you in place. You’ve read self-help books and been to seminars and still you feel stuck. I hear you. I’ve been there. The path seems unclear. I believe that you should be able to chart a clear course to your awakened life. That’s why I distilled hundreds of hours of coaching practices and exercises to develop The Courage To Be Me E-Course. Schedule your 90-minute coaching call. So, purchase the e-course and start your journey. And in the meantime, read the blog entry that inspired this e-course. So you can stop walking around in circles and instead live a life directed by clear purpose. What if I told you that your best true path forward requires that you stop? It may seem counterintuitive at first, but stopping—taking a break from the race called Life—allows for insight and clarity. What if you were able to carve out 30-40 minutes a day for a single week to get clear about where you are at and where you want to go in life? What could that do for you? It will save you from regret down the road. It will give you a sense of purpose in your life, even in the small tasks. It will help you remember that the present situation is not how it’s going to be forever. It will allow you to release what you don’t need which will allow you to go further, faster. are you ready to go further, faster? You are in the right place. 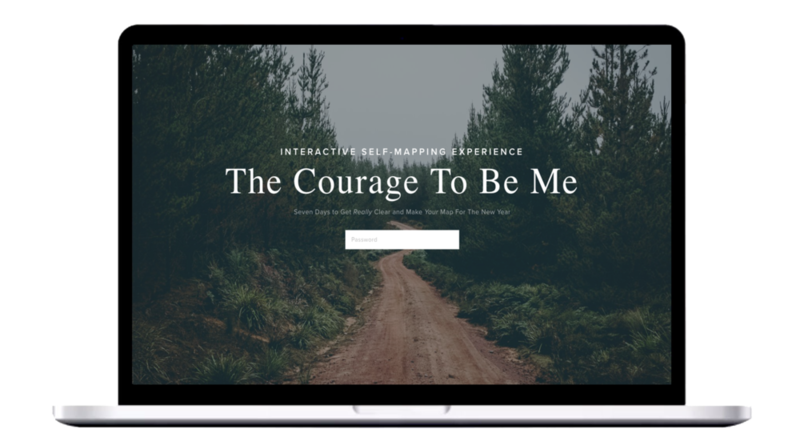 The Courage To Be Me is an interactive experience that is a combination of videos, lessons and interactive assessments that help you uncover the real you. This isn’t just a personality-typing system; this is a form of life coaching that I am delivering to you remotely. I have taken some of the most powerful coaching tools and made them available to you in a self-paced study. The online experience is equivalent to four hours of deep coaching done at your pace. And then we will schedule a 90-minute coaching call to go over your map. This is your chance to do the work so the work doesn’t do you! You will accomplish this by spending about 30 minutes a day—on your computer, phone or tablet— exploring your here, articulating your there and charting a path between the two points. But it isn’t just about setting goals. Goal-setting is great when the time is right. And we’ll cover that, too. But goal-setting before getting clear about why those particular goals are important can derail us or at least take us down a path set by someone else. This is about you owning your life, every aspect! It’s about clearing away the clutter in order to gain clarity. Because when we take courageous steps to get clear, we find ourselves on our own unique path, destined to become who we were meant to become. Do you want to discover who it is you are meant to become—who you could be? When you complete the seven-day online experience, you will be emailed a custom PDF based on your own responses that give you a clear path forward. This is a one-of-a-kind map that your future self created just for you! There are follow-up exercises and notes to help you check in after you finish the online experience. Because as you can imagine, this is not the finish line; this is your true starting line. And if you’re still reading this, my guess is that you’re ready. So let’s do it. You want to live with direction and purpose. In order to do that, you need a guided transformative process that is tailored to you. There are so many self-help resources out there and time is always short and that makes you feel overwhelmed and sometimes even cynical. Will this actually work? Yes. This is your chance for a full reset. Get clear about your Here so that you can define your There and start seeing the results you desire—an awakened life. Looking forward to working with you!